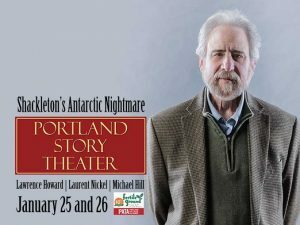 We are giving away a pair of tickets to Portland Story Theater Presents Shackleton’s Antarctic Nightmare @ The Old Church Concert Hall on January 25-26. To win, comment on this post why you’d like to attend. Winner will be drawn and emailed Monday, January 21. Shackleton’s Antarctic Nightmare returns as part of the Fertile Ground Festival in an amazing collaboration with Michael Hill of Wetdog Studios and classically trained cellist Laurent Nickel. Together, they’ve created an immersive visual and audio experience. This is the true story of how Ernest Shackleton and the 27 men of the Trans-Antarctic Expedition of 1914 survived on the ice and eventually came to safety. It is a heroic tale of hardship and suffering, courage, determination, and fortitude. Lawrence Howard has been called the “Homer of Portland” and knows how to take listeners on a journey through the rich landscape of story. One of the original founders of Portland Story Theater, he has a passion for adventure and has created the Armchair Adventurer series. Shackleton’s Antarctic Nightmare launched the Armchair Adventurer series in 2008. This would be really interesting! I’d like to win and go, history is neat to learn about and I would really enjoy this. Riona, You are so right. History is near to learn. Good luck with the contest! I just love music and history. This sounds extremely interesting. Would love to go. Hi Cody, Yes, we’re trying something completely new and very exciting. Good luck with the contest! Nothing like watching someplace colder than Portland for perspective. Hi Kevin, Definitely… Good luck with the contest! I love story theatre, and love a good history story! I would be delighted to bring my 15 yr old son to this event! Hi Eileen, Yes, your son will love it. Good luck with the contest! One of my favorite books on leadership is “Shackleton’s Way”. Hi Susan, Yes, that’s a good one. Best of luck with the contest! I love Portland Story Theater. I’m so excited for the added visuals and music! Hi AJ, So happy you love Portland Story Theater. Yes, the visuals and music are a spectacular addition. Good luck with the contest! This sounds like a beautiful experience. Would love to go on a date with my partner and enjoy the experience! Dear Ashley, Yes, it promises to be a beautiful experience. Good luck with the contest! It’s already freezing, so it’s the perfect time to recount a tale about a guy who managed to keep himself and his crew alive (though the dogs didn’t make it) while packed into pack ice for months without access to Instagram, Snapchat, or even email to communicate how awesome his adventures were. Thankfully modern-day storytellers can recreate images in our minds with nothing but their…words! Dear DT, Yes, it is the perfect time. Good luck with the contest! I enjoy stories and like a night out. Dear Aleks, Glad to hear you enjoy stories. Good luck with the contest! You had me at nightmare. Dear Lee, Excellent. Good luck with the contest! This sounds so interesting especially since I have read a couple of books about that little misadventure. Hi Judy, Yes, it is fascinating. Good luck with the contest! Such an interesting story and would be cool to to hear it in this way! Hi Chris, Yes, this is going to be really cool. Good luck with the contest. I love storytelling! This would be a great event for me to surprise my partner with! Hi Sarah, Glad to hear that you love storytelling. Good luck with the contest! Hi Ellen, Yes, it’s going to be the best. Good luck with the contest! I got chills reading the description. This is a great story, and I’d love to be there for the experience – wow! Hi Jackie, Always happy to find a fan. Good luck with the contest! Looks really interesting! Thanks for the chance to win this. Hi Lisa, Yes, thanks for playing. Good luck with the contest. Hi Terese, Yes! Good luck with the contest! Hello Mike! Yes, it is really good. Best of luck with the contest! There is nothing like listening to a good storyteller and to make it even better is to have them tell of a great adventure. Would love to win and take my adult son for a mom/son date. We had seen God in His splendors, we had heard the text that Nature renders. We had reached the naked soul of man. Wait! The epic of Shackleton plus a cello? I so want in. I adore PDX Story Theater; everything they do is magical! I would love to experience this story! Thank you for the chance to win, PDX Pipeline!